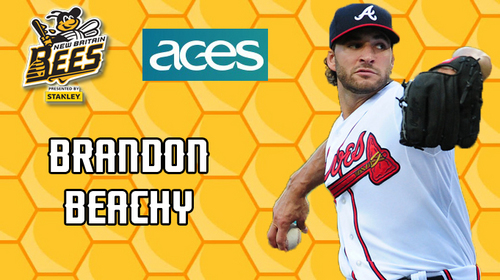 (New Britain, Conn., August 14, 2018) – The New Britain Bees today announced the signing of pitcher Brandon Beachy. Brandon Beachy comes to New Britain for his Atlantic League debut during his ninth year of professional baseball. The former big leaguer last pitched in 2016 as a member of the Los Angeles Dodgers organization. The 31-year-old was originally signed as an undrafted free agent in 2008 by the Atlanta Braves. After three impressive minor league campaigns, he made his Major League debut with the Braves in 2010, appearing in three games and posting a 3.00 ERA with 15 strikeouts in 15 innings pitched. The righthander would spend four seasons in the big leagues with Atlanta, with his most impressive year coming in 2012. In 13 starts, he won five games with a 2.00 ERA, 68 strikeouts and a 0.98 WHIP in 81.0 innings of work. His final year in the Majors came in 2015 with the Dodgers. Over his five-year Major League career, Beachy has started 48 games, posting a 14-12 record with a 3.36 ERA and 280 strikeouts over the course of 275.2 innings pitched. In 98 career minor league games (42 starts), Brandon has collected a 16-9 record with a 2.74 ERA and 307 strikeouts in 302.2 innings pitched.